So, here’s how it went down. 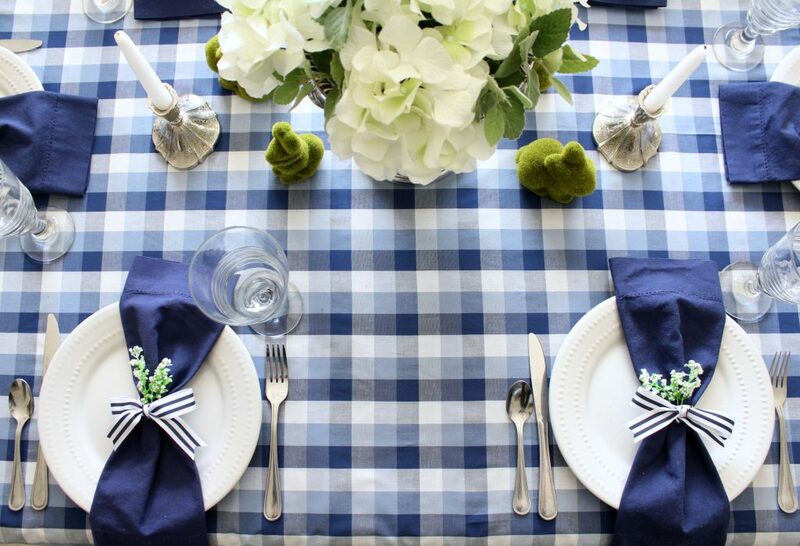 I started with the navy and white gingham fabric as a tablecloth. I did not hem it for this purpose as I often don’t do. You can just press down the edges or use some temporary hem tape if you really want to hide the raw edges. Most of the time the raw edges don’t bother me. 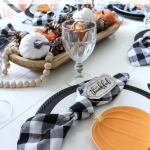 Then, I added my go to white plates from the Dollar Tree. As well as my Dollar Tree goblets. 🙂 You really can’t go wrong with dishes from the Dollar Tree! 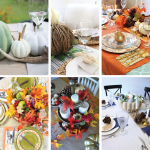 Next year maybe I’ll pull out my Grandma’s china from the attic for a spring tablescape. Next up, those navy napkins I mentioned earlier. I bought these on clearance from At Home a couple of years ago, but you can find similar ones here. Ribbon is one of my favorite napkin ‘rings’. 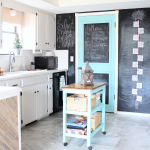 It’s cheap, easy, and customizable. I love a crisp stripe so this navy and white striped ribbon was a great addition. The faux stems of green and white I found in the floral section at Hobby Lobby. They actually all came in a little bunch for only $1.99. 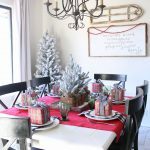 For the centerpiece, I used the silver trophy vase from Vintage Market Days last year. It needed a little polishing, but with the help of some Bar Keeper’s Friend and a little elbow grease it looks nice and shiny now. I didn’t want perfection, so I left a little patina here and there. The silver candlesticks were a gift from our wedding. They were looking a little sad too, so they also got a cleaning. I hardly ever use faux flowers in an arrangement anymore. But, let me tell you, these hydrangeas are fake. I’m sure I could have made the trek to Trader Joe’s or Uptown Grocers and found real ones, but to be honest, I just didn’t feel like it. So, these did the job this time! And bonus, I can use them again! 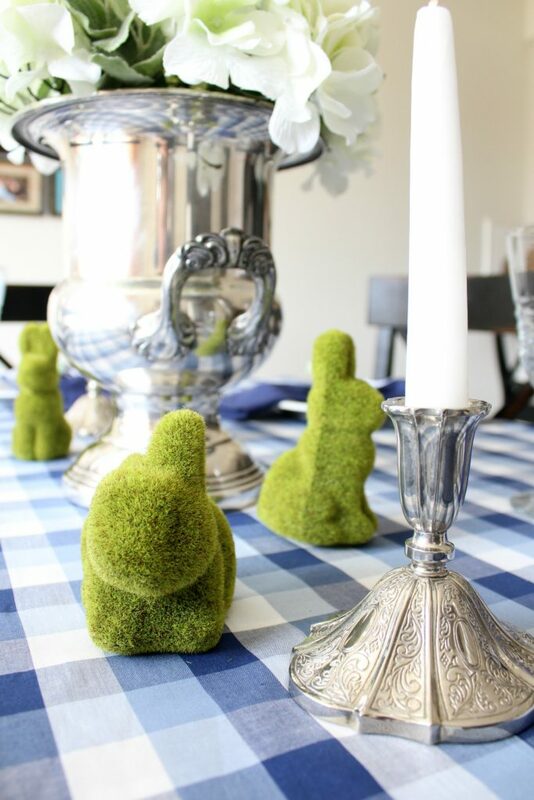 White candles and some cute moss covered bunnies finish up the centerpiece. The bunnies were another Hobby Lobby find. You may have seen on my Instagram stories, but they came as picks and with just a little finessing, I removed the stem so they could just sit on the table. Cute, right?? I was not feeling a whole lot of fuss this time around for this tablescape, so I kept it simple and like I said, it might be my favorite yet! 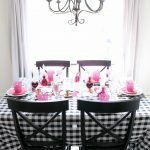 If you want to see my Spring/Easter tablescapes from last year you can check it out here. Love it Denise! I too always have to wait for inspiration to strike and can get so stuck. 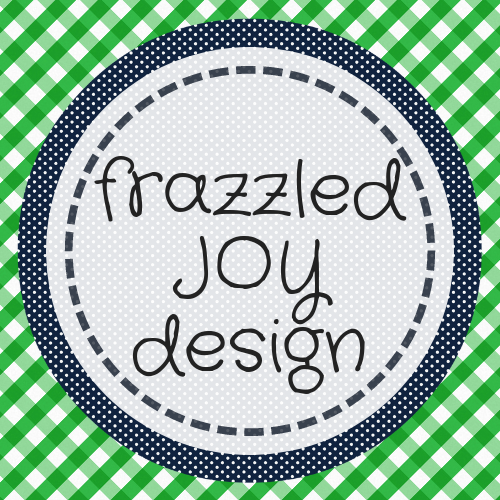 Love that you went no fuss, and the striped ribbon and gingham look wonderful together. I love the napkins with the pretty ribbon! And how cute are those moss bunnies?! 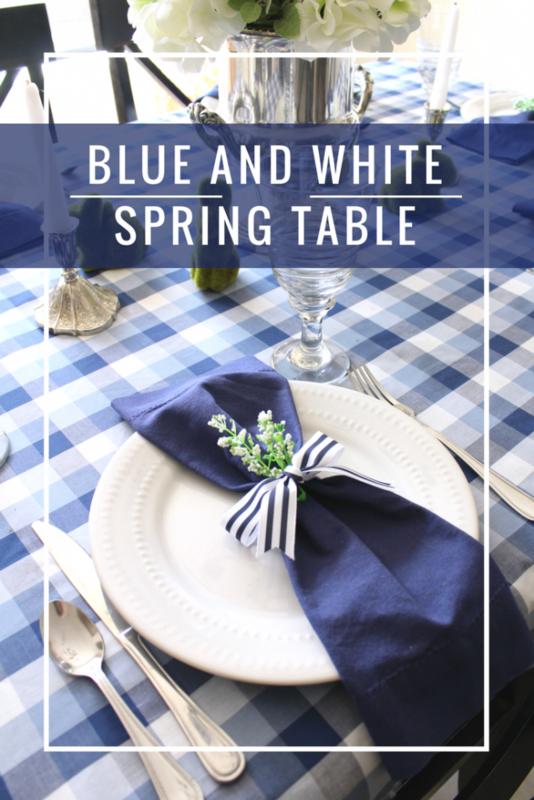 The blue and white check really feels so much like Spring. 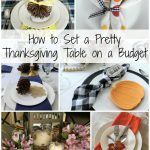 I need to look at the plates at Dollar Tree because yours are perfect for table settings! Love your hydrangea centerpiece! This looks so beautiful! You can never go wrong with navy! It looks great with so many colors. Love the striped ribbon with the little sprig of flowers! So pretty Denise! You know I am a big fan of blue too, and the ribbon is such a cute touch! Love the green bunnies! This is so pretty. 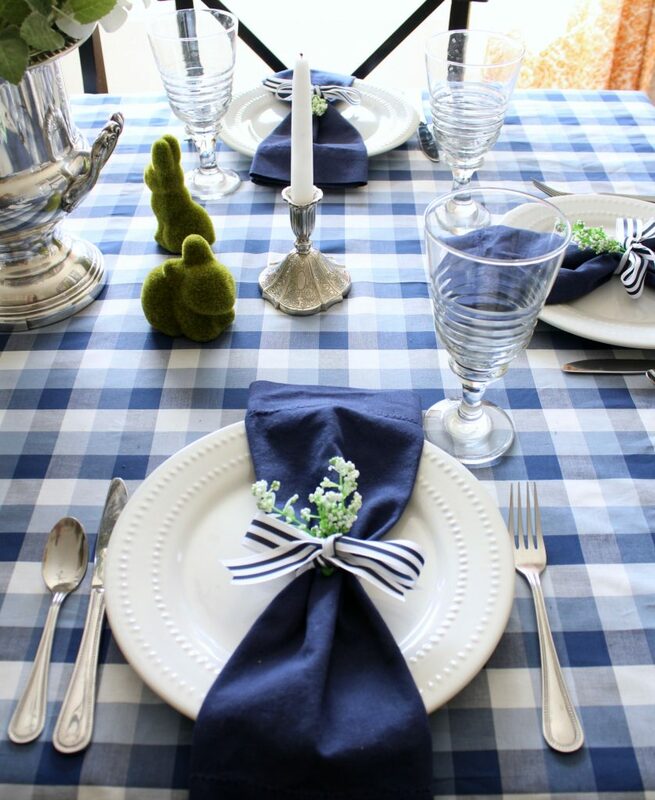 The blue check tablecloth is so fresh and pretty for spring and I love it paired with the green bunnies. Well done!!! 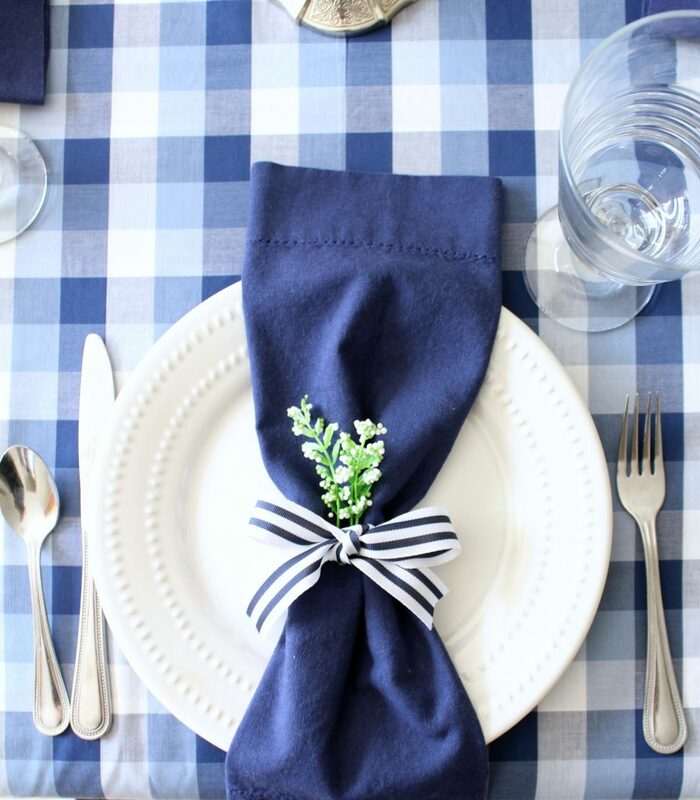 Love the blue check tablecloth paired with the striped ribbon on the napkins. Cute table!! Denise – we too are big fans of blue and white. Your table is beautiful – and that antique trophy is swoon-worthy! Thanks so much ladies! 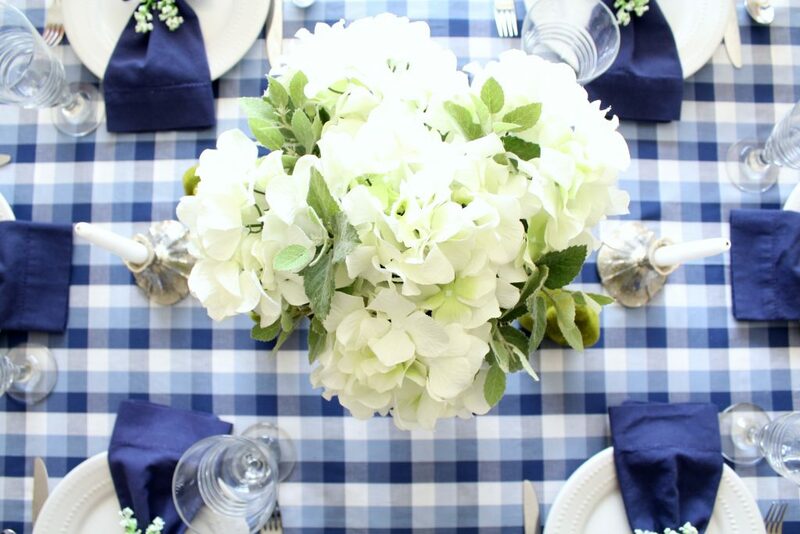 You can’t go wrong with blue and white! Gosh! It is all so lovely! 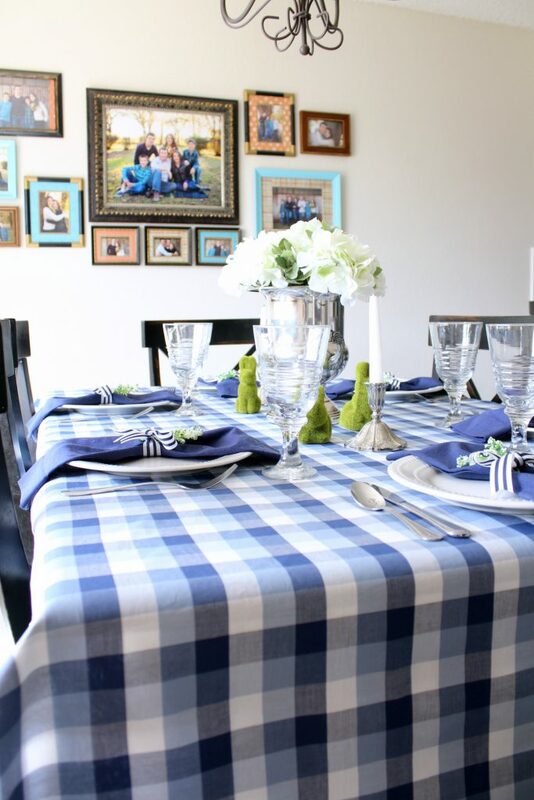 Especially love the blue plaid and the silver vase! 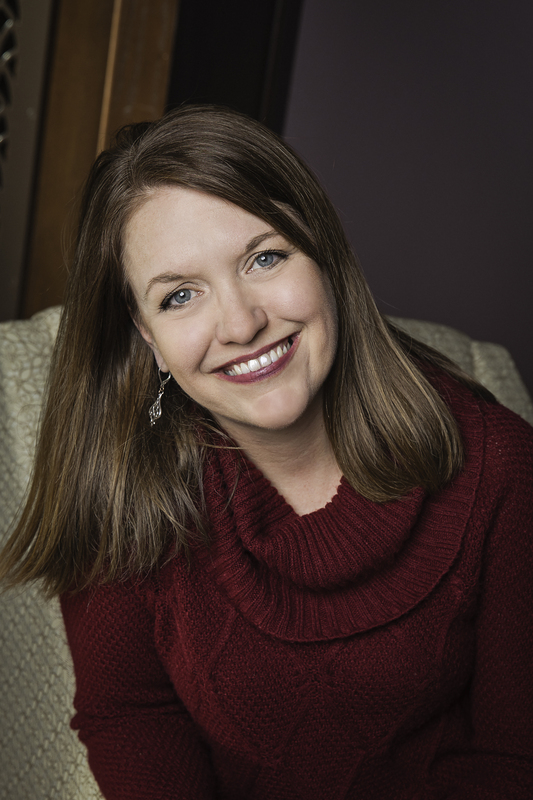 Thank you Amanda! I was excited to find that silver vase last year, and even more excited to finally put it to use! 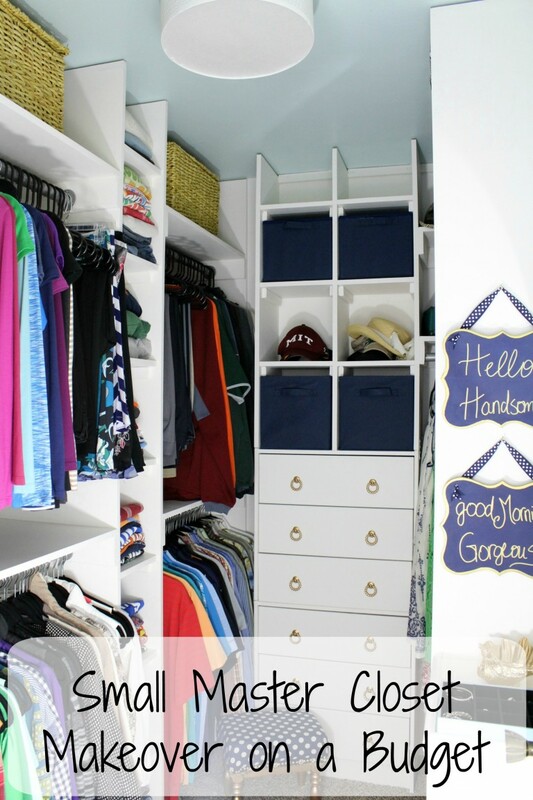 Such a pretty and fresh way to decorate for Spring. I need to add more navy blue to my home decor. Thanks Meegan! 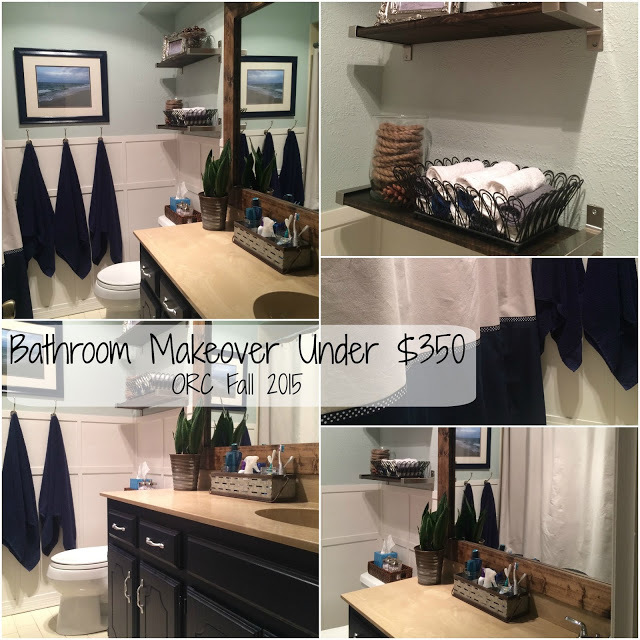 I think navy is a great neutral! I LOVE the navy! And I am with you – I am also lacking inspiration this spring. Despite you’re beginning struggles, this table is absolutely lovely! Thanks for joining in on the hop! 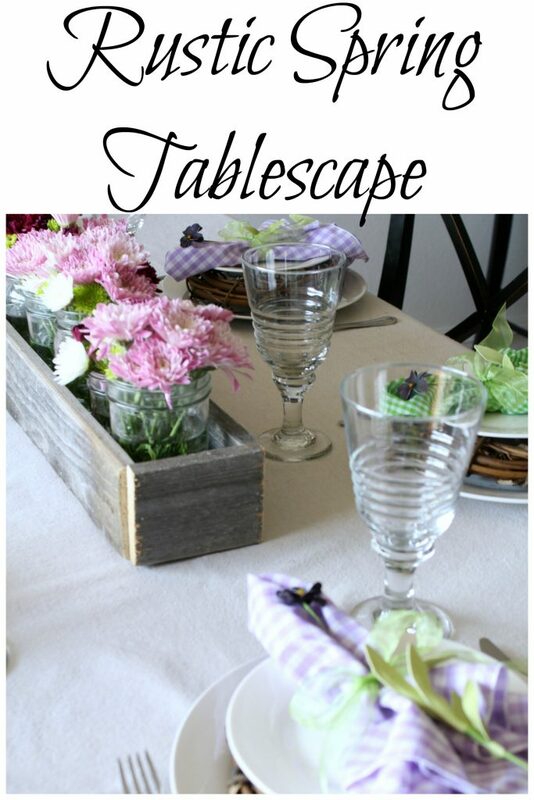 What a beautiful Spring Tablescape! 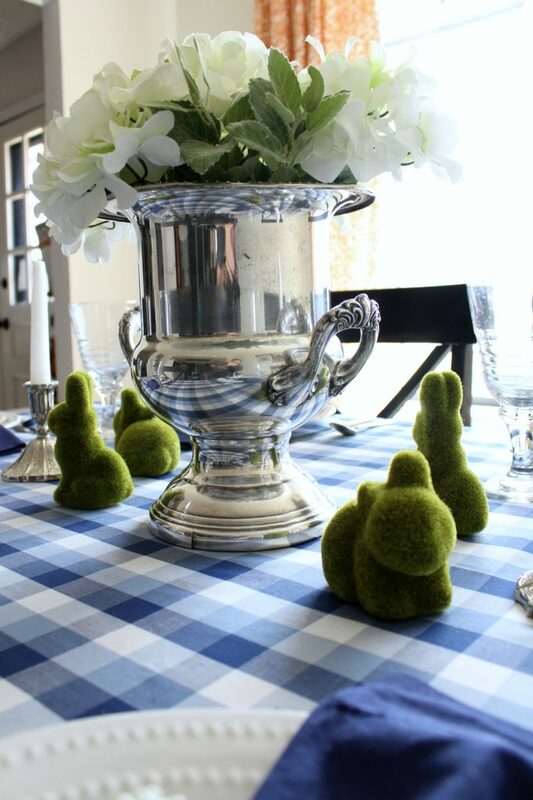 I am a navy lover too so I flipped over your gorgeous tablecloth & the moss bunnies look so great against the navy! I’m crazy for navy too! 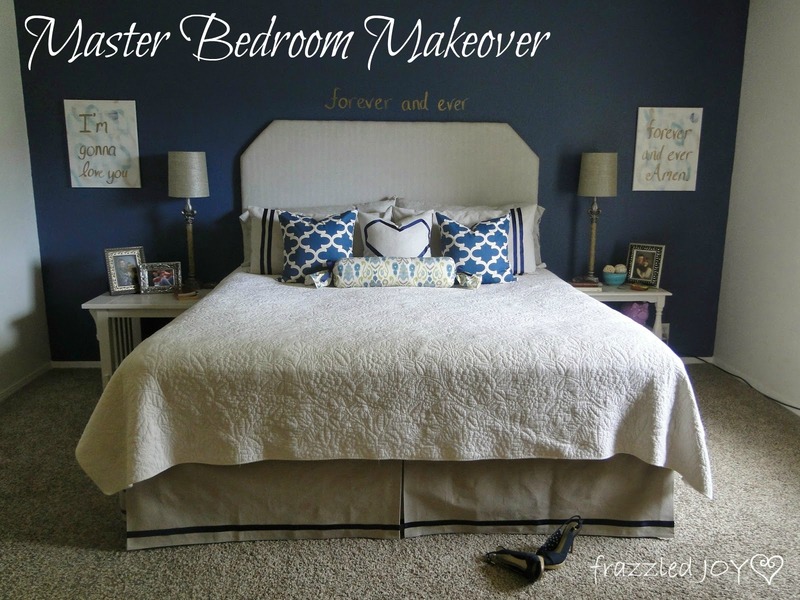 My great room is decorated with navy, blush, and pops of mustard. I’ve even got my husband convinced to paint the room a very light blush instead of the builder beige. 🙂 Your tablescape is beautiful and I love the tablecloth. I have a few of those white plates, too! 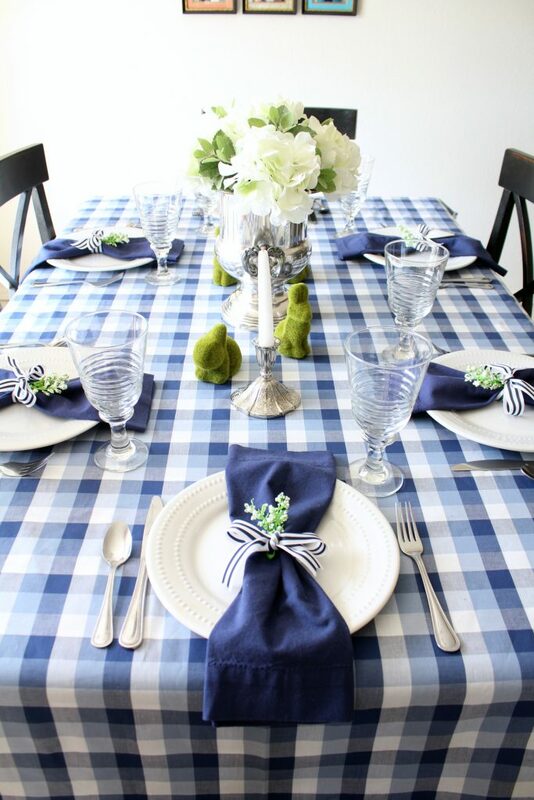 I love how crisp and springlike your tablescape is. It’s gorgeous!